EPD recognition … Lea Kullmann of Dorma (third left) with IBU and UL officials. Dorma, which already offers EPDs, is now looking at providing HPDs for its key products in line with its corporate policy. IN LINE with the company’s philosophy of “enabling better buildings”, Dorma remains committed to ensuring the sustainability of its products and enhancing the environmental credentials of the buildings they are installed in. In line with these goals, the company is now moving towards offering health product declarations (HPDs) for some of its key products. HPD is one of the new requirements of the new Leed (Leadership in Energy and Environmental Design) version 4, which is valid since 2014. HPDs provide information about the content of building products and their impact on people’s health. It’s also a complement to the lifecycle documentation and environmental product declarations (EPDs), says a spokesman for Dorma, a leading access technology specialist. 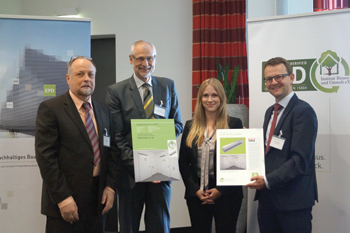 As a leading manufacturer of access technologies for buildings, the Germany-headquartered company believes that sustainability is not a short-term trend but an intrinsic aspect of the company’s long-term business ethos. Hence one way of achieving its environmental aspirations and assuring its global client base of its commitment to sustainability is compliance with various management and assurance systems and obtaining internationally recognised data on lifecycle environmental impact of its products and services, such as EPDs. For instance, Dorma offers EPDs for door closers systems, sliding door systems, door furniture, lock/master key systems and movable walls and is now gearing up to offer HPDs for door closer systems, door furniture, lock and master key systems. “Dorma was one of the first companies to receive to the existing EPD ED 100/900 and ED 250, the recognition by Underwriters Laboratories (UL), an American company in the field of product testing and safety sciences and one of the most important EPD programme holders in the US,” says the spokesman. “The quality of buildings can be improved and increased and for us this is an important initiative to support the requirements of international building certification systems such as Leed,” the spokesman stresses. Dorma introduces new processes and products on the basis of strict criteria governing quality, ecological acceptability and occupational health and safety. It focuses on energy-saving and resource-conserving production, a high recycling ratio, the longevity of its quality products and social responsibility towards its employees. “With comprehensive advice, innovative products and an international service capability, we are able to make a significant contribution to energy efficiency and to drive cost savings derived from sustainable building concepts,” he says. International building certification systems like Leed or DGNB (German Sustainable Building Council) require a high degree of transparency throughout the entire product lifecycle starting from raw material extraction, through manufacturing and utilisation phase, up to subsequent recycling of the products used. Different management systems contain rules governing adherence to statutory regulations, established standards, customer requirements and quality specifications, while also promoting environmental care and conservation, efficient resource utilisation and a proactive approach to occupational health and safety. A current example of the kind of project where Dorma had to meet the requirements covered by certificates such as Leed is the Vodafone Campus in Düsseldorf, Germany. This new group headquarters of Vodafone houses 5,000 employees and measures 86,000 sq m, spread over 19 storeys. Major research into the design of modern workplace environments is reflected in the building concept, with employee requirements being given the highest priority. The building has received the Leed Gold Certificate. Among the criteria assessed are water and energy efficiency, the environmentally sound use of materials and resources, room quality, and commitment to conservation in design and innovation. Particular emphasis is placed on avoiding unnecessary carbon dioxide emissions and minimising energy consumption. The spokesman points out that there is a growing trend globally towards environment-friendly products and the industry now requires companies to taken on entrepreneurial responsibilities. “Not only do legislators, customers and end-users favour eco-friendly products and brands, the pressure from investors is increasing as well,” he points out. The construction and real estate sector makes a major impact on resource and energy savings and thus on the environment due to the fact that large amounts of raw materials and energies for the production and use of buildings is spent. “The Dorma Group bears a great responsibility and is aware of this. That’s the reason why we support all global requirements like provision of EPDs and HPDs across the entire international product range which underlines the company’s philosophy – enabling better buildings,” the spokesman concludes.